The Journal of Machining and Forming Technologies (JMFT) is a refereed, international Journal that publishes high quality articles with an emphasis on research and development in recent advances in machining and forming technologies. JMFT provides discussion and the exchange of information on all important aspects of modern industry. JMFT focuses on machining and forming technologies, including traditional machining (turning, milling, drilling, etc. ), non-traditional machining (EDM, USM, LAM, etc. ), abrasive machining, hard part machining, high speed machining, high efficiency machining, micromachining, internet-based machining, metal casting, powder metallurgy, extrusion, forging, rolling, drawing, sheet metal forming, microforming, hydroforming, thermoforming, incremental forming, plastics/composites processing, ceramic processing, hybrid processes (thermal, plasma, chemical and electrical energy assisted methods), etc. The machinability and formability of all materials will be considered, including metals, polymers, ceramics, composites, biomaterials, nanomaterials, etc. 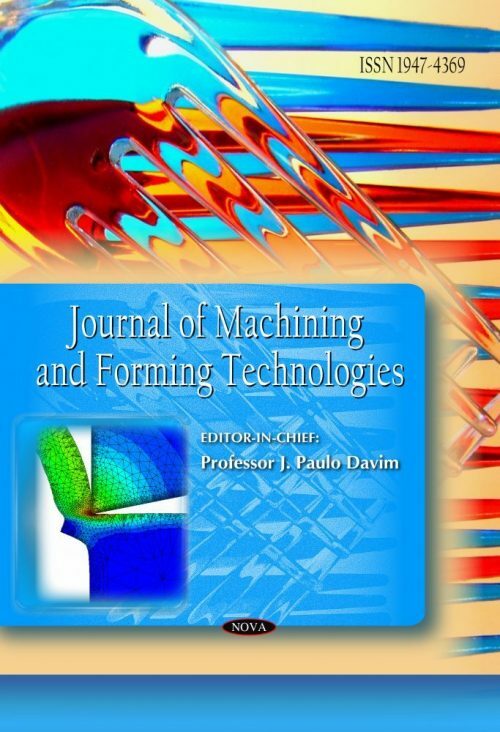 The Journal covers the computational and optimization techniques applied in machining and forming technologies such as FEM modelling and simulation, micro/macro modelling, thermo-mechanical modelling, numerical simulation including new and advanced numerical strategies, inverse identification, design experiments, statistical methods, genetic algorithms, neural networks, fuzzy systems, particle swarm optimization, etc. Contributions to JMFT are welcome in the following formats: original full research articles, review articles, technical notes, and case studies. Articles and contributions are welcome on all subjects of machining and forming technologies. Especially welcome are articles and material that pioneer new research directions, raise new questions and new possibilities, or examine old problems from a new angle. JMFT also publishes special issues on selected topics reflecting recent advances in machining and forming technologies or on selected articles of conferences. Proposals can be submitted directly to the Editor-in-Chief. Journal of Machining and Forming Technologies is a peer-reviewed journal that publishes four issues per year. The journal is owned and operated by Nova Science Publishers and funded entirely by subscription revenue and author-optional publication services. Articles should be submitted by e-mail directly to the Editor-in-Chief, Professor J. Paulo Davim. Double-blind peer-review and publication decision are carried out and made by the Editor-in-Chief in cooperation with the Editorial Board.